instant idli mix recipe is a homemade instant idli mix made with rice flour, urad dal and poha (flattened rice). 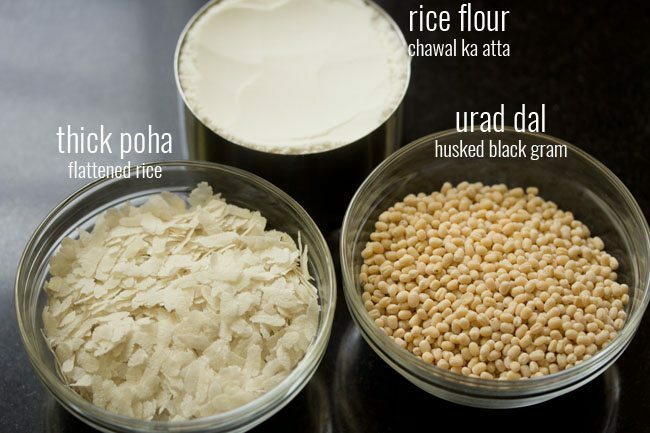 instant idli mix recipe with step by step photos – homemade instant idli mix made with rice flour, urad dal and poha (flattened rice). the idlis made with these instant idli mix are soft, fluffy and goes very well with coconut chutney or sambar. i had some recipe requests for sharing instant idli mix as well as instant dosa mix. generally, i do not prepare instant idli as i feel fermented idlis are better. but since i had got the recipe requests, i did prepare instant idli flour twice . the flaws which were there in the idlis first time, were covered when i tried the second time. so now sharing a fool proof method of preparing instant idli flour. this recipe roughly gives 480 grams of instant idli mix. after preparing you can store in an air-tight jar. you can only prepare idlis with this mix. the dosa made from this idli mix were soft but not very crisp and at times were sticking to the pan. i have developed a separate recipe for instant dosa mix. 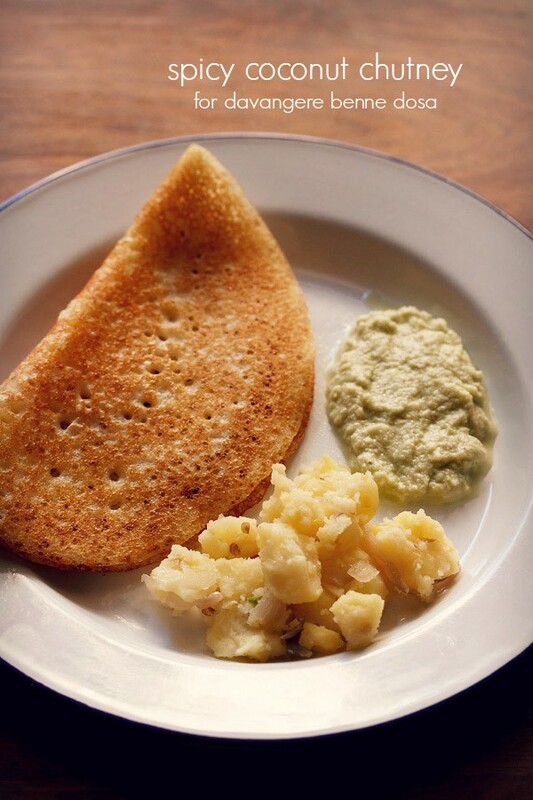 you can also check this instant dosa and instant idli recipe with poha. 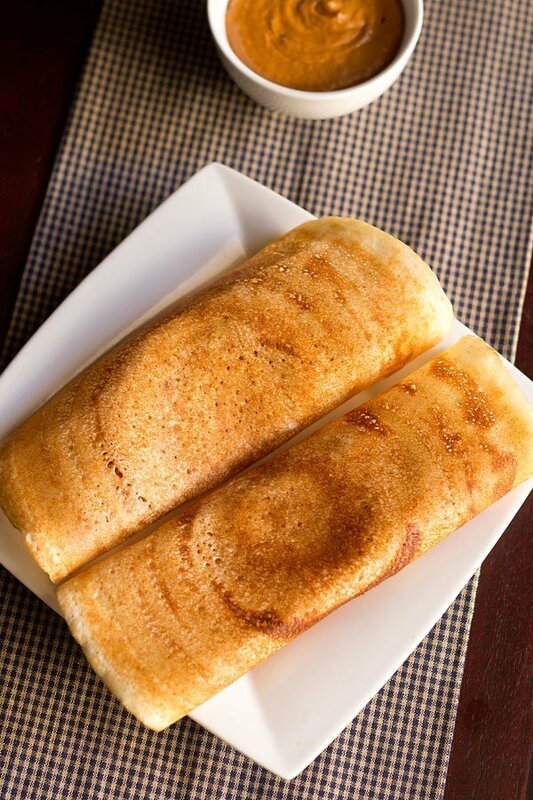 for making fermented idli and dosa , i have already shared the method to make the batters. the texture of these instant idlis is like the fermented ones. but the taste is not like the fermented idlis. though idli made from an instant idli mix are a savior on busy days. also do use sour curd for preparing the idlis. with sour curd, there is a hint of sourness in the idlis. you can also use buttermilk. in this recipe post, i am only sharing the instant idli mix recipe. 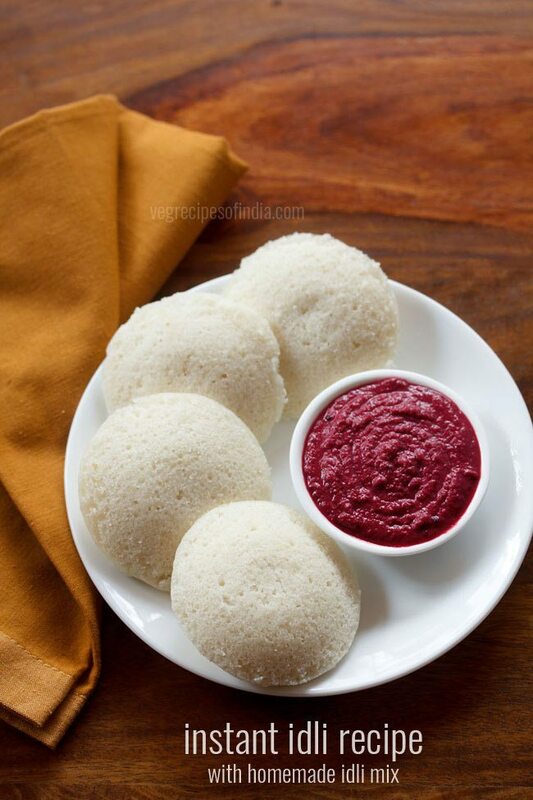 you can check instant idli recipe here. but i have mentioned both in the recipe card & in the step by step pics on how to prepare idlis with the instant mix. 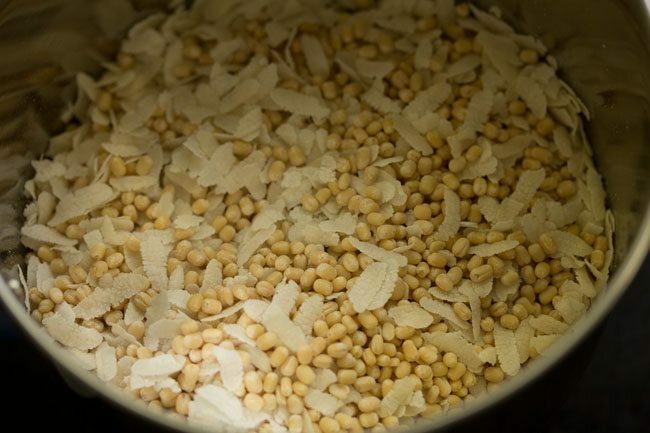 take all the three main ingredients before you proceed - 2 cups rice flour, 1/2 cup urad dal and 1/2 cup thick poha. heat a pan on a low to medium flame. then lower the flame, add the urad dal. roast urad dal on a low flame for about 2 minutes, stirring often. urad dal is roasted just to get rid of some moisture from them. mix very well and roast for a minute on low flame. remove the pan from the stove top and let this mixture cool down. then add everything in a grinder jar. grind to a fine powder. keep a large plate or tray or pan and place a sieve on it. 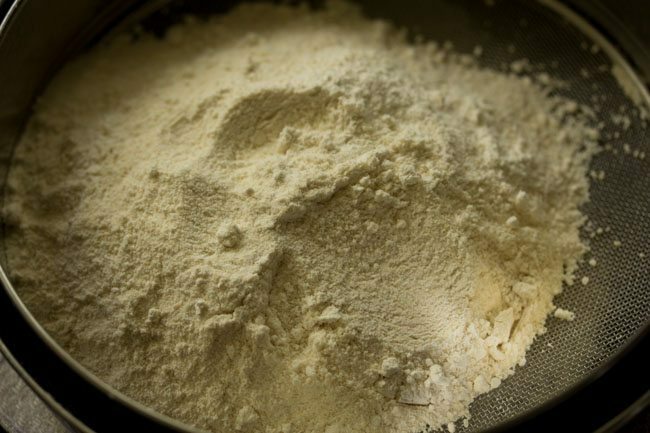 take the ground flour in the seive (channi) and sift it. some urad dal grits will be there. you can add them to your dals or discard. add rice flour and salt. mix very well. the idli mix is ready to be bottled. 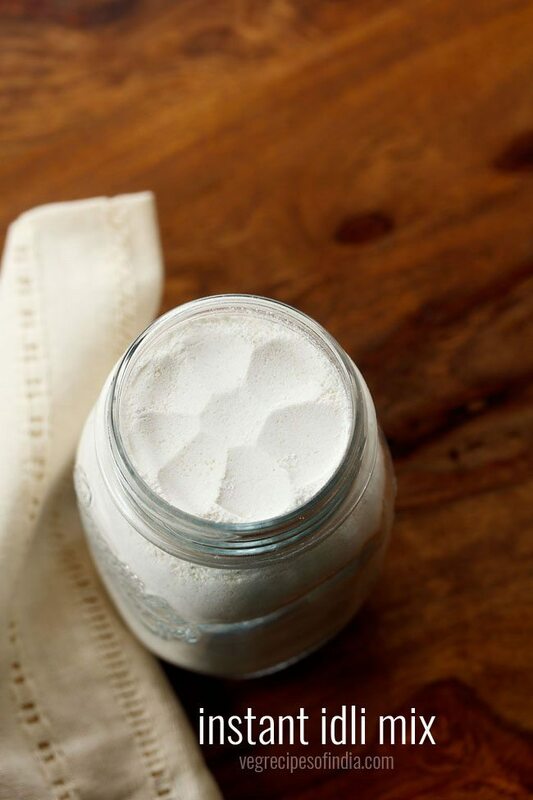 with a spoon, add the idli mix flour in a jar. seal tightly with a lid. use the idli mix when required. first mix idli mix flour, water and sour curd very well. 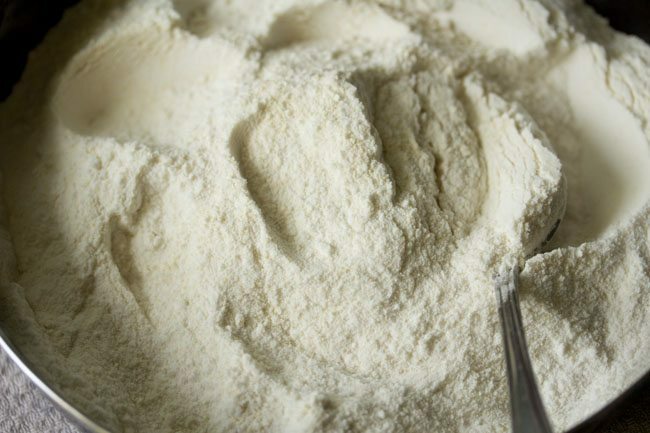 use a wired whisk to make a smooth lump free batter. then add ½ teaspoon fruit salt or eno. again mix very well. then pour in a greased idli pan and steam the idlis for 10 to 12 minutes. 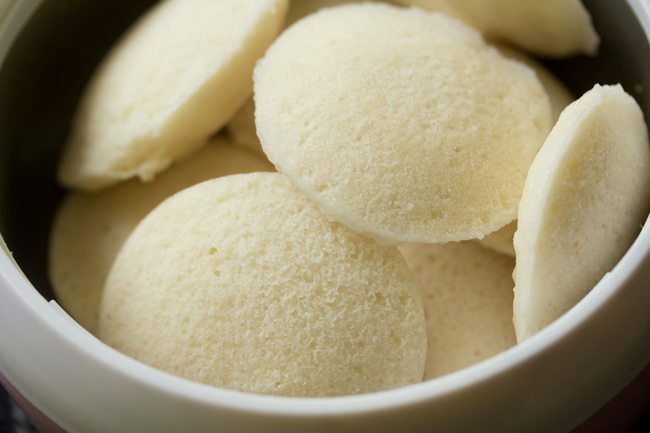 avoid using baking soda as it gives a soapy aroma in the idlis. 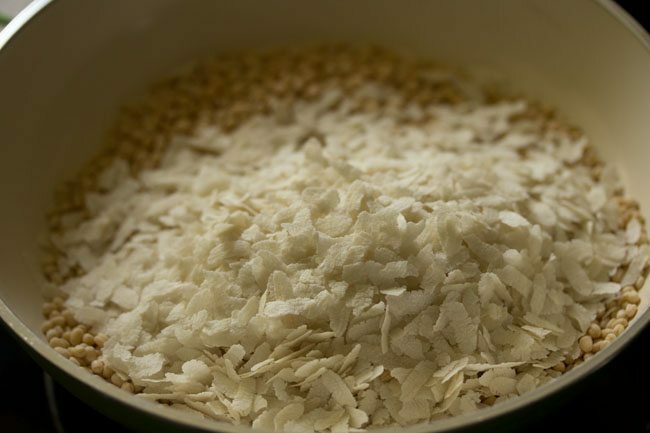 1. take all the three main ingredients before you proceed – 2 cups rice flour, ½ cup urad dal and ½ cup thick poha. 2. heat a pan on a low to medium flame. then lower the flame, add the urad dal. i have used organic unpolished urad dal. 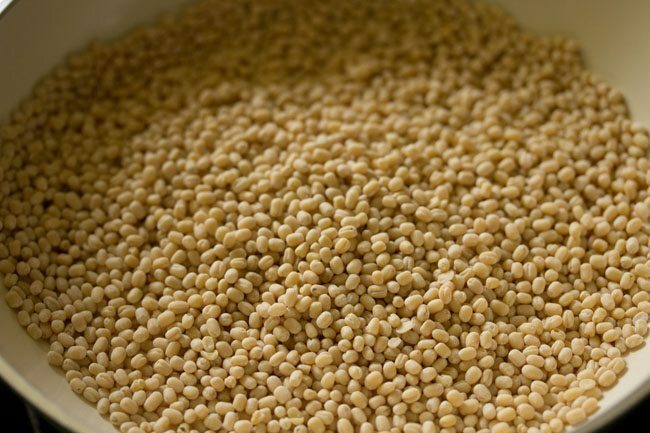 if using regular urad dal from the market, then rinse it a couple of times. the spread the lentils on a plate or tray and let them dry naturally or in the sun. if keeping in the sun for a few hours, then you don’t need to roast urad dal. 3. roast urad dal on a low flame for about 2 minutes, stirring often. urad dal is roasted just to get rid of some moisture from them. 4. then add the poha. 5. mix very well and roast for a minute on low flame. switch off the flame and immediately remove the pan from the stove top and let this mixture cool down. you can also cool this mixture on a separate plate. 6. then add everything in a grinder jar. 7. grind to a fine powder. 8. keep a large plate or tray or pan and place a sieve on it. 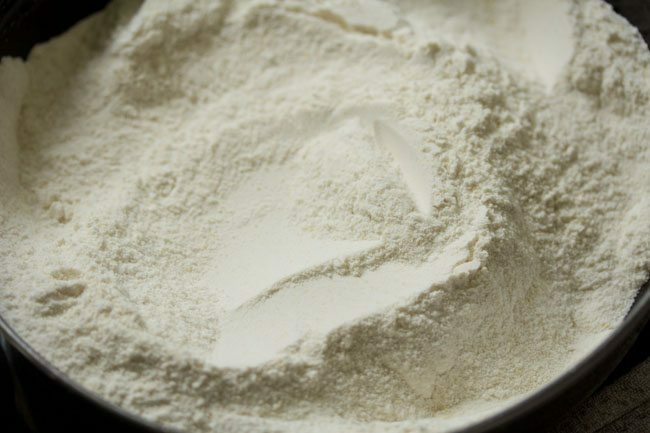 take the ground flour in the seive (channi) and sift it. 9. some urad dal grits will be there. you can add them to your dals or discard. 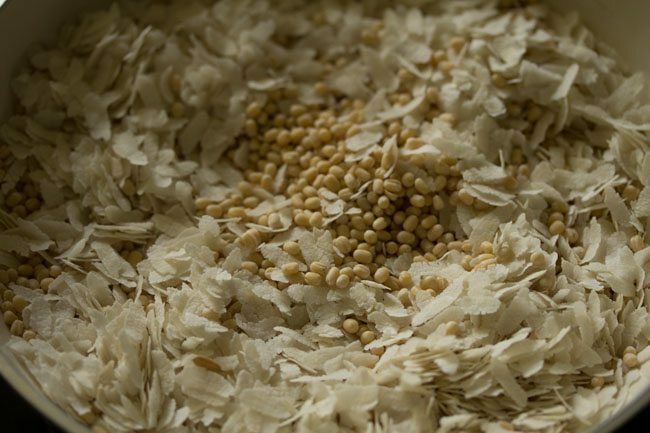 10. the below picture is of the sifted urad dal and poha flour. 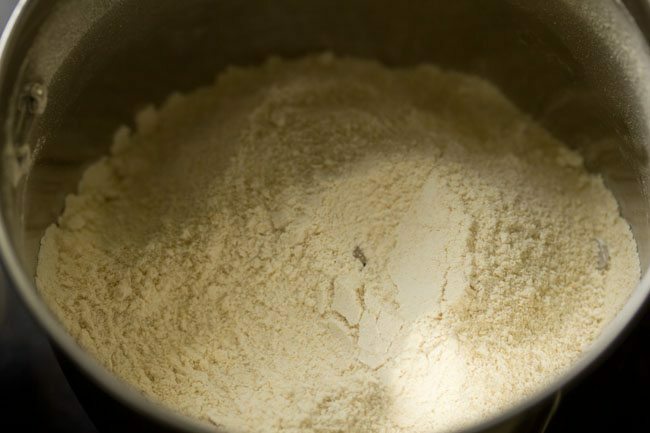 11. add 2 cups rice flour and ½ teaspoon salt. i have used fine rice flour. 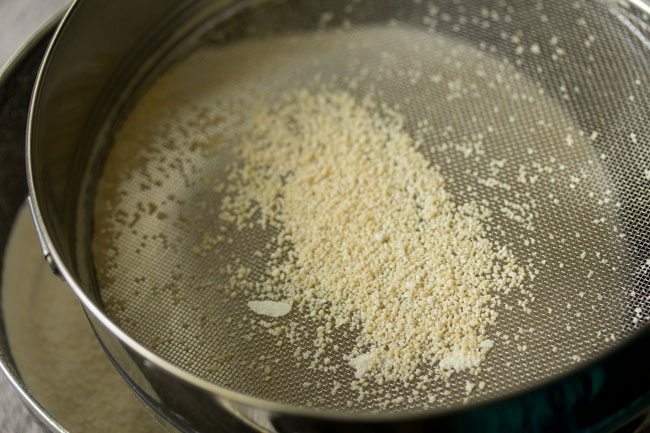 you can also use a slightly coarse rice flour. even puttu flour can be used. both white as well as red rice flour can be used. 13. the idli mix is ready to be bottled. 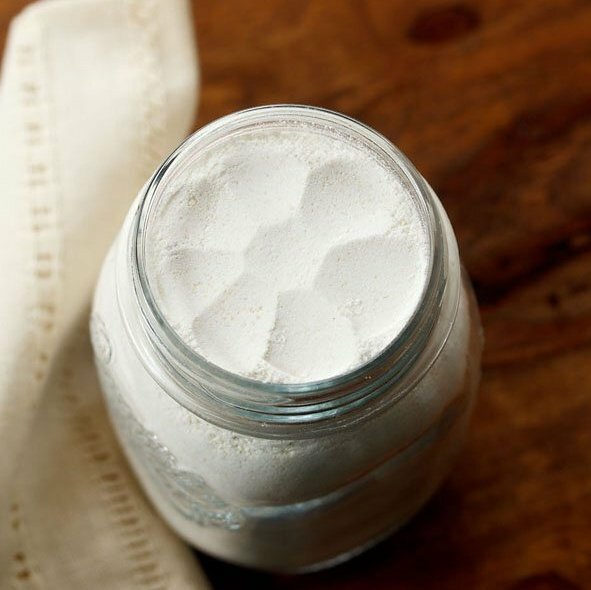 14. with a spoon, add the idli mix flour in a jar. seal tightly with a lid. 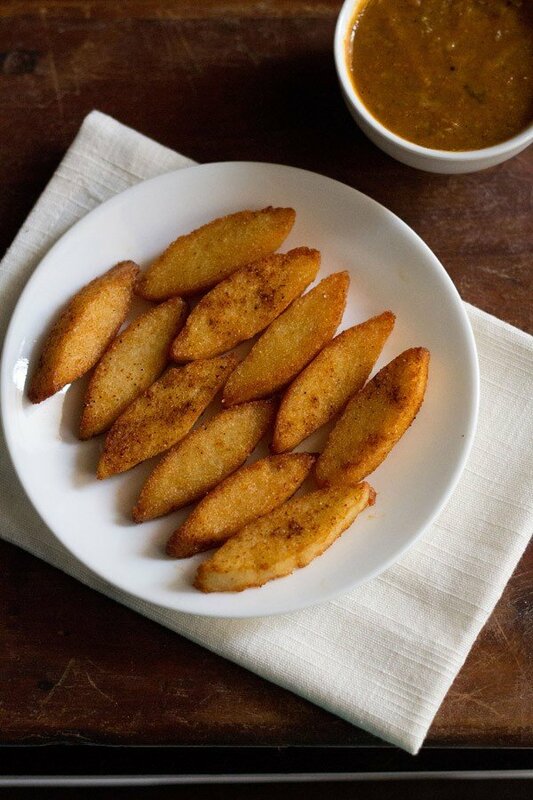 use the idli mix to make soft and fluffy idlis when required. first mix idli mix flour, water and sour curd very well. make a smooth lump free batter. then add ½ teaspoon fruit salt or eno. again mix very well. then pour in idli pan and steam the idlis for 10 to 12 minutes. avoid using baking soda as it gives a soapy aroma in the idlis. 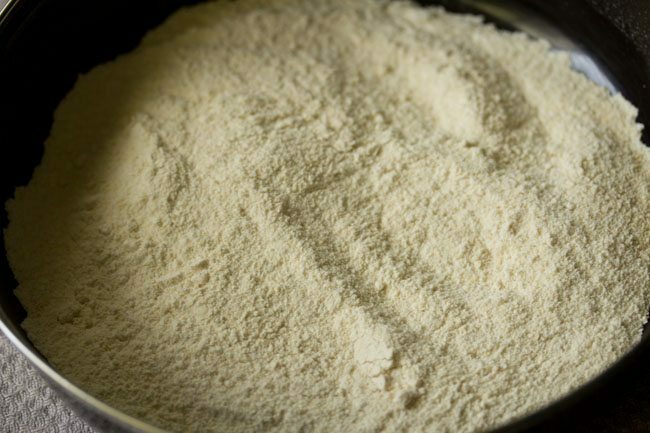 What happens if you use fine ground raw rice flour and black gram flour without roasting? 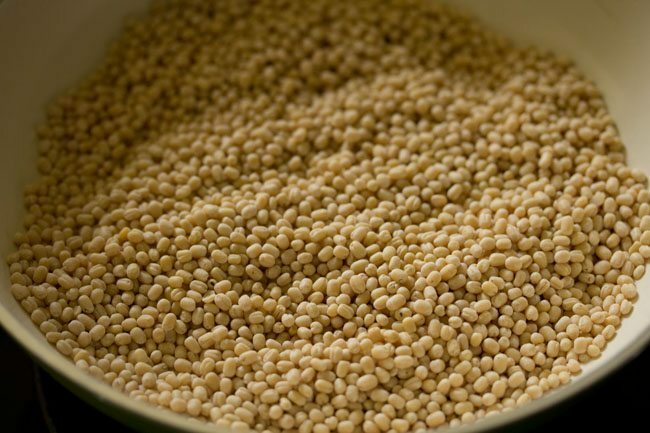 dry roasting reduces moisture from the urad dal and poha. so the shelf life increases. moreover roasted urad dal will grind faster. but you can skip roasting if you prefer. I tried this recipe today. Idlis tasted great and I did not have to add eno 😊. I made the powder last night and let the batter ferment overnight with curds and water. I had to add more water than what was recommended in the recipe. Thank you so much for this recipe. Really appreciate it and all the other east handy recipes that you publish 😊🙏🏼. The only thing I noticed was that the idlis were not fluffy, they seemed more flat. Any suggestions on how to get them to be fluffy? thank you sudha for this detailed comment. 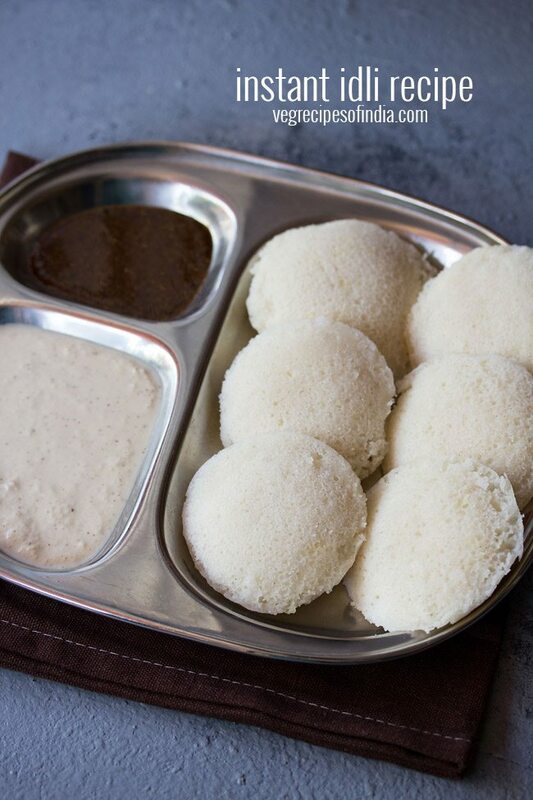 if there is more water in the batter, then the idlis will become flat. 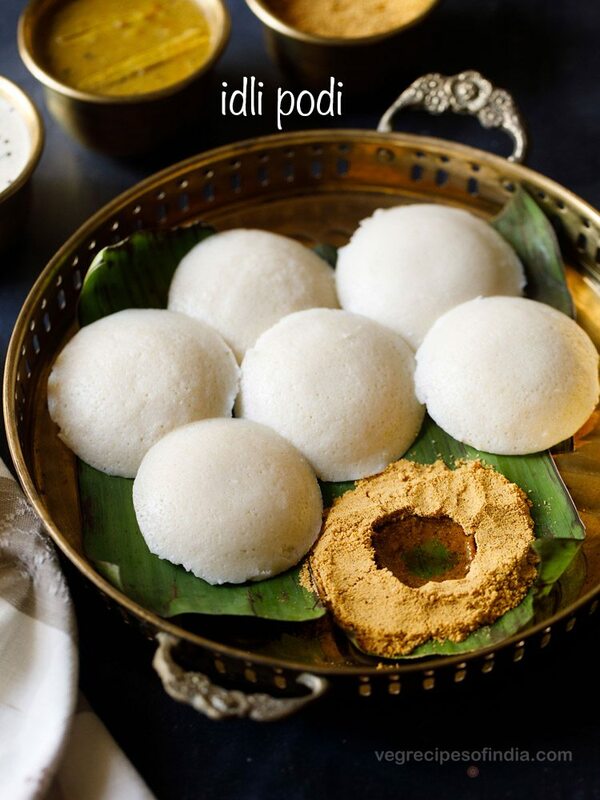 even with fermented idli batter made by grinding rice and urad dal, more water or thin batter makes the idli flat. next time you can add less water than what you added this time. 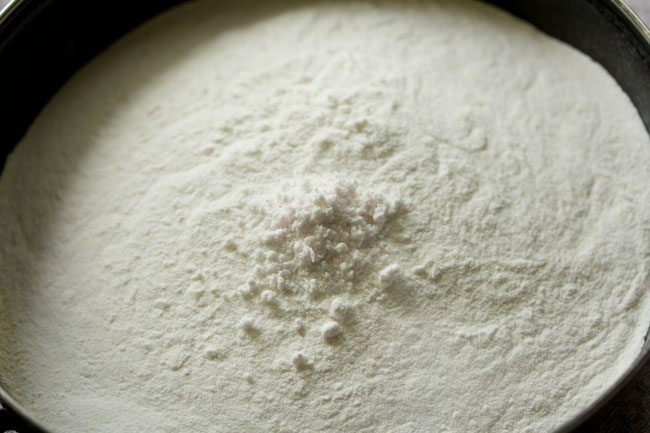 the batter consistency can be like a proper idli batter or having a medium-thick consistency. in recipes like these one to two pinches of eno or baking soda (even if the batter is fermented) helps in making softer and fluffier idlis. is this raw rice flour or boiled rice flour. Nice recipe. It comes very handy in peak winter. 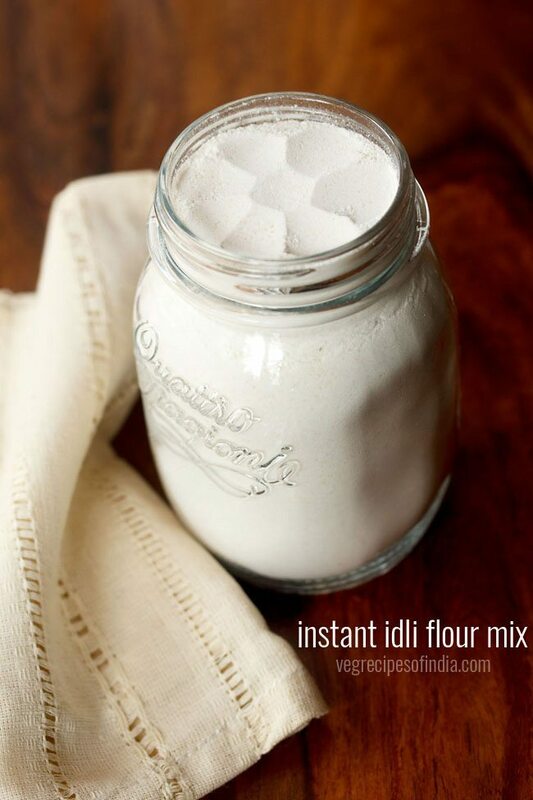 you can use the dry flours. you can soak them together overnight. you don’t need to soak them separately for 2 hours. since here urad dal is not ground, it won’t ferment like the regular idli batter. so you will need to add a bit of baking soda. so you can add 1/4th to 1/2 teaspoon of baking soda. mix very well and then steam idlis. you can also add some curd or buttermilk in the flours and keep them to ferment overnight.